ATVs, or All Terrain Vehicles are also called quads, quad bikes, three-wheelers, four-wheelers and quadricycles. They function like a motorcycle although their speed is slower and riding them is more stable due to their three or four wheels. In the Philippines, more and more tourists are adoring riding this engaging vehicle as they revel in the breathtaking mountain views, lush landscapes, majestic waterfalls and really exciting trails available for them. 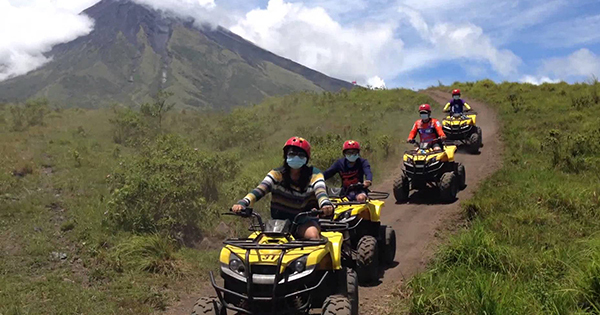 #1 - Bicol Adventure ATV (Cagsawa Ruins, Busay, Daraga, Albay, Bicol Region) - Experience an up close view of perfect - coned Mount Mayon via an ATV ride towards its lava wall! Absolutely no prior know-how required on how to use an ATV -- all it takes is 5 - 10 minutes to learn how to use its ignition, throttle, brakes, and direction. With their expert tour guide, drive safely through a river and rocky trail towards picturesque Mount Mayon! This could be one of your most action-packed adventure of all -- it's your call! #2 - Danasan Eco Adventure Park (Barangay Danasan, Cebu Island) - Fill your hearts with joy and laughter as you savor your adventures over at Danasan Eco Adventure Park! Not only will you enjoy your 20- minute ATV ride with a guide as you glide through the mud; they also have other exhilarating activities such as zip lining, rope climbing, horseback riding, rappelling, waterfalls exploration, and spelunking ... plus you get to have the chance to stay overnight in their stylish hotel with all the important amenities, should you wish to maximize your enjoyment of this fun, fun place! #3 - Boracay Adventures Incorporated (Barangay Balabag, Aklan) - It is the right season to go out and paint the town red! Head over to Boracay, but don't just stay on White Beach, another way to appreciate this paradise island is by riding an ATV (for one person) or Buggy Car (for two persons) towards Mount Luho, to get a panoramic view of captivating Boracay Island! After which, take selfies or groupies from the 3D Gallery, and then take a joy ride towards serene Puka Beach...Boracay Adventures Incorporated, by the way, not only provides ATV's or Buggy Cars for its guests, they cater to divers, island hoppers, spa lovers, golfers and parasailors as well. #4 - X-Treme Sports Philippines Adventure Park (Puerto Galera, Mindoro) - Their awesome 150cc ATV's will definitely be loved by you and your company! At an affordable rate of only Php 600, you get to do 6 laps, drive through a lush jungle, muddy trail, and just simply enjoy the ride! Don't you worry for they have got shower facilities where you can freshen up and change your clothes should you wish to play hard. But wait, they have more! More than just ATV's ... they also offer paintball, mud karts, go-karts, crossbow & airgun range, in addition to archery tag. Now, that's swag! #5 - ATV Petrohead (Porac, Pampanga) - All work and no play makes a dull person -- this may sound cliche but has a lot of truth in it. So tarry no more, and whoop it up with your buddies or family by riding an ATV in Porac! You can rent either their ATV or Buggy Car, or both if you wish. Expect to pass through some rivers and see waterfalls especially after some raining; to top it off, indulge as well in picture - taking, let the tour guide tell you the best spots for photo ops. Moreover, it is best to wear a swim suit for this fun ride and don't forget your extra clothes to change to once your adventure is done. Let the thrill begin!